Do you want to be able to have this experience even when on a ketogenic diet for weight loss? 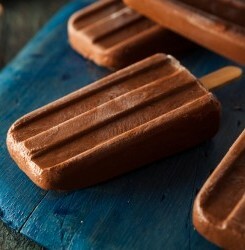 Then this super simple fudgesicle recipe is for you! These vegan, dairy-free, gluten-free, and low-glycemic treats are sweetened with stevia and contain a considerable amount of healthy fat from coconut. 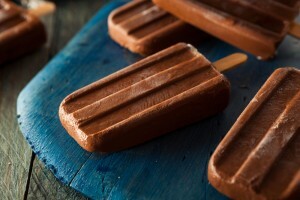 How did your fudgesicles turn out? Let us know in the comments below! I am looking forward to trying the chia breakfast drink & the popsicle recipe. Thank you! Dr Colbert, thanks for the recipe. I’m looking forward to trying it. I’m however unsure of some of your terms – they work differently in my part of the world. How much in mls or ounces is a can? By dark chocolate do you mean dark cooking chocolate (which looks like a slab of chocolate) or unsweetened hot chocolate powder or cocoa powder? Once I’m clear on these I’m definitely trying this recipe out. Hi Phumi! You can use any unsweetened chocolate. A can of coconut milk is typically 13.5 fl oz. Hope this helps! Great help, yes. Thank you! Never heard of coconut butter. Where do you find it?